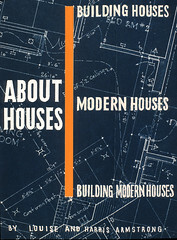 Armstrong drew and designed this book cover for a book on modern houses in the 1940s. While they submitted the manuscript to several publishers it was never published. The typed manuscript was mimeographed by Louise Armstrong informally bound for distribution. During WWII there was limited work available for architects as building supplies were in short supply and capital resources were devoted to the war effort. Many architects set about putting down their ideas about the future of the modern American home though articles and books. Many such books were published at the time. A good example is "The Modern House in America" by James and Katherine Morrow Ford.